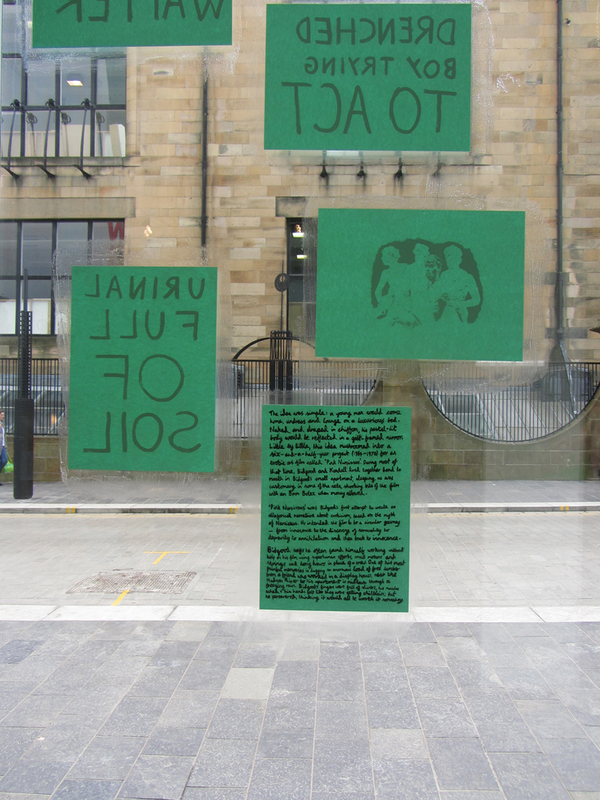 5 insults, 2 fantasias, and words by Bruce Benderson is a set of eight digital prints which were pasted onto the window of the Reid Gallery while being displayed alongside A rhetorical folding screen for James Bidgood, White Adonis, and Crockery I moved to Glasgow with prepared for plantings. Seven of the prints face outwards, the insults being obtuse and mildly derogatory statements (in the same lexical sphere as the ancient Athenian quip ‘you are as sterile as the gardens of Adonis’), while the fantasias are ink drawings based on two of Bidgood’s classicist photographs. The words by Bruce Benderson, from a monograph on Bidgood and written by hand, face inwards, towards the gallery and the other works.